The first Polyglot Conference was organised by Richard Simcott and Luca Lampariello in Budapest in October 2013. I love Budapest which only added to my regret that I found out about the event too late to take part. The October 2014 Conference was going to be held in Canada but, luckily for those of us based in Europe, the venue switched when the Cultural Centre of Novi Sad offered to play host. What a great opportunity for me to visit Serbia for the first time! I arrived at my hotel at the less than ideal time of 2am in the morning. Bad weather had delayed take-off from London so I missed my connection to Belgrade in Zürich and was re-routed via Frankfurt. Viewed positively, the delay meant two unexpected opportunities to practise my languages. At the airline’s help desk in Zürich airport, I was able to deal with the re-routing in German. On arrival, instead of the planned early-evening cab share with Simon of Omniglot, I found myself stuck on my own in a car for the hour-long drive to Novi Sad. My driver did not speak much English, but, at age 45, was one of the generation who had learned Russian in school and was keen to use it. The following morning, and for the next three, I had breakfast with other conference participants al fresco at the hotel’s café. The Conference coincided with an Indian summer, sunny days in the low twenties, unseasonably good even by local standards. The city was lovely. The centre is quite compact with many neo-classical, pre-first World War buildings and several squares. The main artery, Zmaj Jovina Street, and several other central streets, were pedestrianised and lined with cafés. There was a relaxed atmosphere with locals promenading or gathering in groups. Altogether, there seemed to be a real café culture. All the places I tried served great espresso. After the Friday afternoon opening ceremony there were tours of the town. They set off from Freedom Square (Trg slobode) in front of the imposing statue of Svetozar Miletić (the nineteenth century mayor and champion of Serbian political rights) which faces the neo-Gothic Name of Mary Roman Catholic Church (known as the Cathedral). 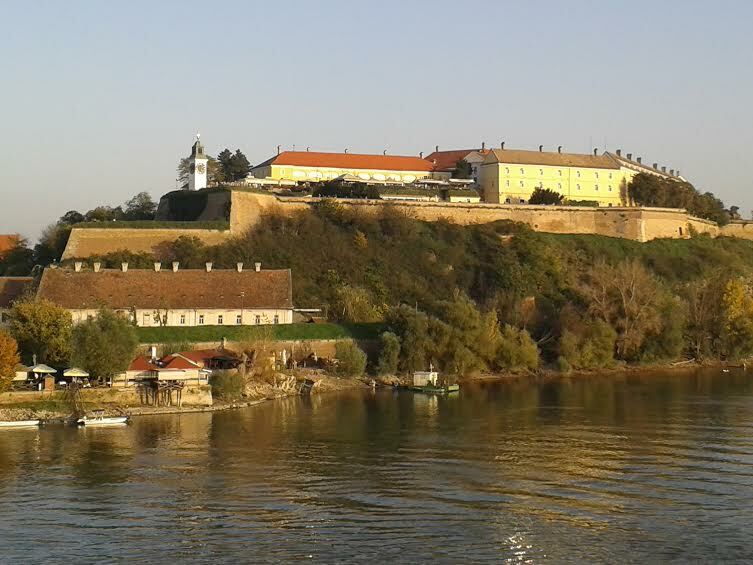 We walked over the Danube on the Varadin Bridge (destroyed by NATO bombing in 1999) to the Petrovaradin Fortress. I have heard Serbo-Croat (as I still think of it) many times before and it has always been top of the list as my potential second Slavonic language. I was surprised, and a touch disappointed, that most of the signage, including all the signs in the airport, used the Latin script. I was under the mistaken impression that, while Croatian uses Latin letters, Serbian is written exclusively in Cyrillic. It turns out that Serbians use both scripts. As a fluent Russian speaker, I can get the rough sense of conversations in the other Slavonic languages but you can’t always work out the details. Understanding some menu items certainly proved to be a challenge. Some of the words on signs and notices were quite amusing to a Russian speaker, because of the shift of meaning between the two languages. There were signs everywhere saying “izlaz” (exit), which to me suggested clambering out (lazit’ in Russian means to climb). Mmmm….When in Rome Serbia….Would St Cyril approve? The Novi Sad Cultural Centre was a modern building with a large lecture theatre at the back and a conference room upstairs. There was a wrap-around roof terrace where lunch was served. The hospitality was once again great, with the staff bringing out trays with shots and soft drinks after the opening session and during lunch. The organisers had put together an appealing range of talks. The inevitable scheduling clashes meant that I missed several enticing sessions, including a panel on minority languages in Vojvodina, Leonas Tolvaiši’s talk on promoting Serbian and branding Serbia abroad and Conor Clyne’s appreciation of linguistic diversity. Of the sessions that I heard, five stood out. Michał Grześkowiak talked eloquently about his work as a language coach. “To be a good coach,” he said, “you have to be addicted to asking good questions”. Helping learners get clear about what will change in their life if they learn the target langauge really helps with motivation. A good coach should be supportive along the way, but also challenge the learner when required. Developing a learner’s mindset, said Grześkowiak, is crucial. What students think they need may need to be challenged (somebody worried that he needs to study more grammar when he already has a good knowledge may really need to get out there and speak more). Methods should be based on how memory works but also fit in with a learner’s life-style. Carole Westercamp spoke about the “magic of metaphor” or “the right brain’s unique contribution to the left brain’s language learning capability”. “You cannot,” she said, “motivate yourself with your left brain.” Storytelling is a way to work around the left brain’s resistance. Unfinished stories, in particular, arouse curiosity. Listening to a story can shift brain activity from beta waves (conscious processing) to alpha waves (a daydream state, good for absorbing new information at a deeper level and consolidating information already learned). Budapest-based polyglot Alex Rawlings spoke on learning and maintaining multiple languages. It was important to set realistic goals. A six-month target of intermediate-level was reasonable. Things cannot be rushed, so why compress the time period when you could be solidifying your knowledge? Setting aside slots to study is important but, for Alex, “less is more”. He likes to study up to a maximum of an hour a day, in fifteen minute chunks. Connecting with people to speak the language was an “enormous priority” as was becoming familiar with a language’s cultural context. A kind of “remote immersion” is possible using the internet and Alex said that his Hungarian grammar book had become like a Sudoku puzzle. His current leisure reading was “exclusively in German” in order to maintain that language. The subject of reading was Dr Alexadner Arguelles’ topic. He saw a clear relationship between language students’ vocabulary size and their reading practice. Extensive engagement with long, single-authored texts (that mean novels not Twitter – take note you at the back of the class!) is, argued Arguelles, the most efficient way of acquiring true mastery of a language’s vocabulary. Without it, you will stagnate at a more basic level. Even if your goal is just functional conversation, you’ll get there quicker if you read. Arguelles went on to discuss technique, to evaluate different resources (such a graded readers and audio books) and to explain his polyglot reading routine. There was much food for thought in this talk and I will return to the subject in another post. I will also return to the first session I attended: Nataša Šofanac’s talk on the interpreter’s craft. Several of the sessions were held bilingually with Šofanac’s colleagues hard at it in the booths. The lecture theatre was full for Martine Alonso Marquis’ bilingual conversation with Branisav Sovilj about her experiences creating and acting as “Naša Snajka” (“Our Daughter-in-law”) which has become a hilarious Serbian YouTube hit. Not bad for a French Canadian political scientist. As always at conferences, the social side added greatly to the enjoyment. There was quite an overlap in participants with the Polyglot Gathering in Berlin in June and it was great to see many people again whom I’d got to know a little there. It was also good to meet other enthusiastic language learners for the first time, not least some very inspiring Serbians, such as Stahinja, from Belgrade, who is just finishing post-graduate work on medieval Japanese literature (the way one does) and some fellow Brits, including a Russianist based in Kosovo and now learning Albanian and the language teacher and gifted vlogger Lindsay Dow. The conference finished with short but passionate speeches from Andrey Fajgelj, Director of the Cultural Centre (speaking in English), and Emanuele Marini, one of Polyglot Conference team (an Italian, speaking Serbian). After that, in a nice touch, we all went downstairs to collect our bilingual participation certificates, before assembling in the courtyard for the group photo (see main shot). The next Polyglot Conference will be in New York City in “the Fall”, as the locals might say (10th and 11th October 2015). Hope to see you there! Nice post! One correction though: the Polyglot Gathering 2015 will be from May 1-4 in Berlin. The Polyglot CONFERENCE will be in New York. Both will be much larger than this year. Looking forward to running into you next time!